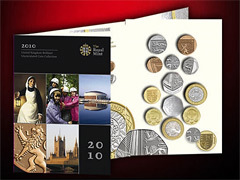 We stock a wide range of British coin sets from the Royal Mint and other coin companies. We specialise in previous years and years of significant interest. 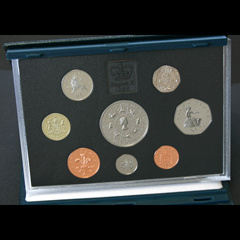 These coin sets are ideal for collectors and as a great gift - for christenings, weddings, birthdays and anniversaries. 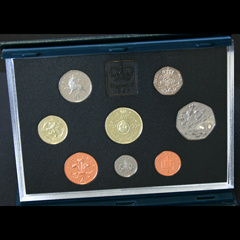 Coin sets and coin collections such as the last of the pre-decimal coins and, Coronation years, Maundy coin sets, in a range of coin finishes from proof coins to uncirculated and even some general coin sets. View our range of Medallions and Tokens. Also includes One Penny, Half Penny, Sixpence, brass threepenny bit and a farthing. 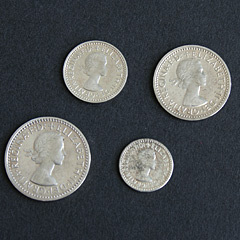 Set of 1910 silver Maundy Coins, struck specially by the Royal Mint to be handed out by His Majesty's Royal Maundy. Obverse effigy of Edward VII, (Edward 7th) coins in uncirculated condition as issued, 4 denominations 4d, 3d, 2d, 1d. 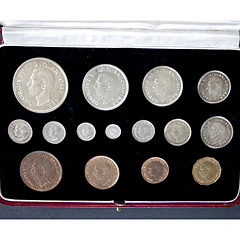 A fantastic 1937 Royal Mint 15 coin uncirculated and original boxed proof specimen set including 1937 Coronation Crown to Farthing. With minor natural discoloration to some of the coins, especially on the obverse (head) side. 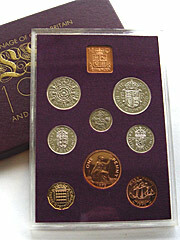 15 denominations - Crown, half Crown, Two Shillings, Shilling (2 variants), Sixpence, threepence, One Penny, Half Penny, Farthing and Brass Threepence, also the Maundy 4d, 3d, 2d and 1d. An excellent Set. UK Confirmed addresses only. Royal Mint proof 10 coin collection for 1953 including 1953 Coronation crown. 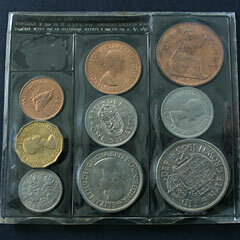 This set is in excellent condition, the One Penny has natural discolouration. Commemorates the coronation of Elizabeth the 2nd. 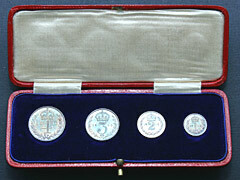 Set of 1969 silver Maundy Coins, struck specially by the Royal Mint to be handed out by Her Majesty's Royal Maundy. Some natural discoloration, especially to the 1d. Obverse effigy of Queen Elizabeth 2nd (EIIR,QE2) coins in uncirculated condition as issued, 4 denominations 4d, 3d, 2d, 1d. Contains Half Crown, Two Shillings, Shillings, Sixpence, One Penny, Half Penny and Brass Threepenny Bit. Contains Half Crown, Two Shillings, Shillings, Sixpence, One Penny, Half Penny and Brass Threepenny Bit. 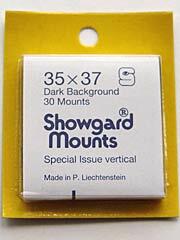 Slight Seconds, either discoloration or minor damage to plastic case. 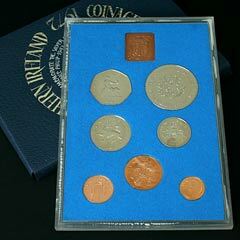 Year set of 1972 coinage of Great Britain and Northern Ireland. Includes 1972 Silver Wedding Crown. Contains: Crown, 50p, 10p, 5p, 2p, 1p, half penny. Includes 2 of the 2 Pounds coin - Claim of Rights and Bill of Rights, and the Scottish 1 Pound, amongst the coin collection. 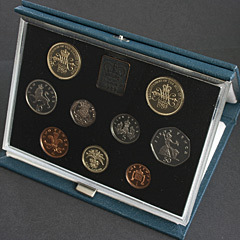 United Kingdom Royal Mint Proof Coin collection for 1990, contains 8 sealed proof coins in a presentation sleeve, makes an ideal present. 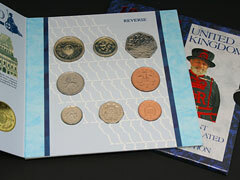 Includes the Shilling (5 pence) large old style and new small style. Obverse shows the Raphael Maklouf portrait of QEII. Comprises Welsh 1 Pound, 50 pence, 20 pence, 10 pence, 5 pence old, 5 pence new, 2 pence and 1 pence. 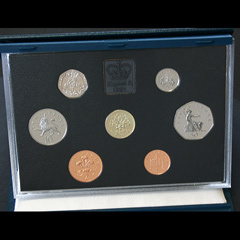 United Kingdom Royal Mint Proof Coin collection for 1991, contains 7 sealed proof coins in a presentation sleeve, makes an ideal present. Obverse shows the Raphael Maklouf portrait of QEII. Comprises Northern Ireland 1 Pound, 50 pence, 20 pence, 10 pence, 5 pence new, 2 pence and 1 pence. United Kingdom Royal Mint Proof Coin collection for 1993, contains 8 sealed proof coins in a presentation sleeve, makes an ideal present. Obverse of the crown shows the Robert Elderton portrait and the others are the Raphael Maklouf portrait of QEII. Comprises the 1993 5 pound Crown, Royal Arms 1 Pound, 50 pence, 20 pence, 10 pence, 5 pence new, 2 pence and 1 pence. United Kingdom Royal Mint Proof Coin collection for 1994, contains 8 sealed proof coins in a presentation sleeve, makes an ideal present. Obverse of the coins are the Raphael Maklouf portrait of QEII. Comprises the 1994 Bank of England 2 pound Coin, Scottish 1 Pound, D-Day 50 pence, 20 pence, 10 pence, 5 pence, 2 pence and 1 pence. 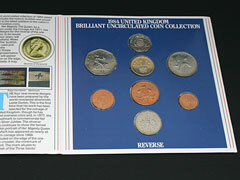 Includes 5 Pound, 2 Pound and Pound amongst collection. 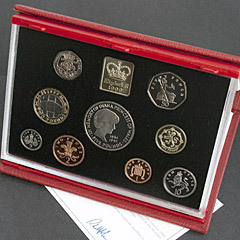 United Kingdom Royal Mint Proof Coin collection for 1999, contains 9 sealed proof coins in a deluxe padded red presentation sleeve, ideal present. 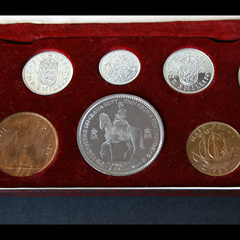 Includes the 5 pound coin struck in memory of Princess Diana of Wales and the Rugby World Cup 2 pound coin, and the Lion Rampant 1 Pound, amongst this coin collection. 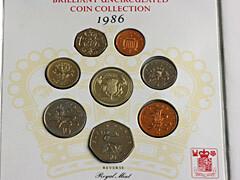 The 1984 coins of Great Britain uncirculated coin set, includes a 1 pound, 50p, 20p 10p, 5p, 2p, 1 pence and half penny. Issued by the Royal Mint, The obverse design is by Arnold Machin. 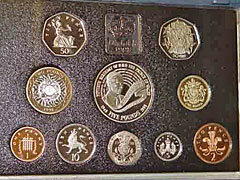 The 1986 coins of Great Britain uncirculated coin set, includes a 2 pound, 1 pound, 50p, 20p 10p, 5p, 2p, 1 pence. Issued by the Royal Mint, The obverse design is by Raphael Maklouf. 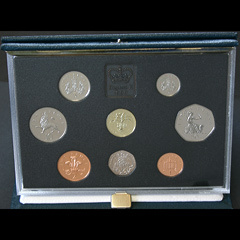 The 1990 coins of Great Britain uncirculated coin set, includes a 1 pound, 50p, 20p 10p, 5p, 2p, and penny. Issued by the Royal Mint. 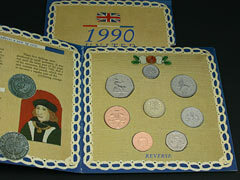 The 1994 coins of Great Britain uncirculated coin set, includes a 2 pound, 1 pound, 50p, 20p 10p, 5p, 2p, and penny. 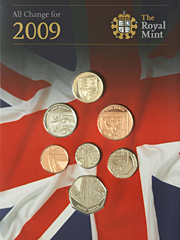 The 2009 coins of Great Britain uncirculated coin set, includes 1 pound, 50p, 20p 10p, 5p, 2p, 1 pence. Issued by the Royal Mint, reverse design by Matthew Dent, obverse design by Ian Rank-Broadley FRBS. Product Limited to 100,000. We also stock an extended range of coins, tokens and medallions at our shop where visitors are welcome, for rare and specific coin year sets and other collectors coins please Contact Us with details of what you are looking for.